On 29 April 2000, the Bonny Hicks Education and Training Centre was inaugurated to commemorate the life of Bonny Hicks, a well-known Model and Writer. 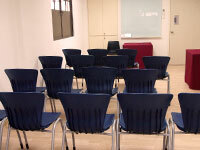 The Centre is well equipped for training courses and meetings with 4 rooms ranging from 21sq m to 112sq m in size. 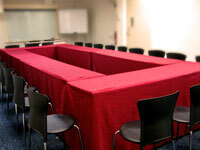 These rooms can be utilised for training, meetings and workshops. Please call 6837-0611 OR complete the Room Booking Form and email it to FR@scwo.org.sg. Download the Room & Equipment Rates. All requests for booking of rooms must be made through the official booking form. Only the official form is acknowledged for room bookings. Strictly 1 free parking allotment per event. Vehicle Number must be registered prior to event. Viewing of rooms are by appointment only, and no viewing is possible when rooms are occupied. For a minimal amount of $10 per week, we will advertise your events held at SCWO on our website. If it coincides with our newsletter circulation day, we will also include it in as a service. The combined platform allows you to reach out to more than 200,000 people! For more enquiries, contact us at FR@scwo.org.sg.